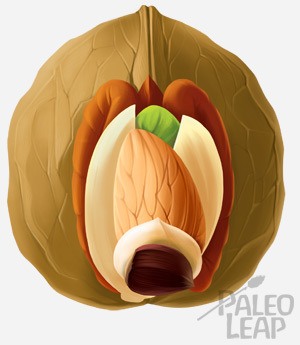 On Paleo, nuts are a gray area. They’re convenient and they’re tasty, but they’re not the healthiest thing you could be eating, and nut-based imitation junk food is one of the most common ways that people follow the letter of the Paleo law, but not the spirit – with predictably suboptimal results. That doesn’t mean it’s necessary to avoid nuts entirely, just that you’ll do yourself a favor it you pay attention to how much you’re eating, and keep it down to roughly a handful per day, 2 at the most (one handful roughly equals ¼ cup of nut flour). Another great way to minimize potential downsides of nuts, though, is to choose your nuts carefully. Almonds are probably the most popular, because they’re the most widely available and more and more companies are starting to make them in different flavors. (This is your obligatory reminder that peanuts are not technically nuts; they’re legumes, so they’re not Paleo in the first place and don’t count). Cashews, walnuts, and pecans are all snacking favorites. But even though they’re less common, there’s another kind of nut that actually has more health benefits: macadamias. Macadamia nuts really reduce one of the major problems with most other nuts: fat quality. The macadamias have roughly the same total amount of fat, but to make up the missing Omega-6, they have more monounsaturated fat – that’s the same kind in avocados and olive oil. That makes macadamias a much higher-quality source of fat than most other nuts, with a much lower potential to be inflammatory. In fact, some studies have even shown it to be anti-inflammatory. In this one, for example, obese mice either got macadamia oil supplements or nothing. The macadamia oil reduced inflammation and fat cell hypertrophy (hypertrophy = getting bigger, which is exactly what you don’t want your fat cells to do). Yes, it’s in mice and not humans, but it’s still interesting. As for micronutrients, unfortunately macadamias can’t match the nutrient profile of almonds or cashews, but they are high in several important nutrients, like thiamin (Vitamin B1), manganese, and copper. Because macadamias aren’t as popular as other nuts, there haven’t been a lot of studies specifically testing their effects on human health. But there is this one, where macadamia nuts helped improve blood lipid profiles. The study is particularly exciting because it was done on human subjects with a normal daily consumption of nuts (1.5 ounces per day). All in all, if you’re going to eat nuts, macadamias are some of the best. The low Omega-6 content makes their fat quality much better than other nuts’, and there’s a small but interesting amount of research testifying to their potential benefits. They’re not the most nutrient-dense food you could be eating, but that’s why they’re an extra and not a staple. Buy in bulk. You can save incredible amounts of money buying bulk dry goods online instead of shelling out for individual packages in stores (this also goes for spices, nut flours, and other products). Alternately, check brick-and-mortar bulk stores in your area to see if they carry them. If you aren’t going to use all the nuts you buy at once, just store them in the freezer to keep the fats safe until you want to eat them. Eat fewer nuts. Nuts should never be a staple source of calories in your diet anyway. Maybe the price tag on the macadamias can help get you interested in finding better snacks – try some olives, a chicken drumstick, or carrot sticks with homemade mayo instead. One of the reasons why macadamias are so much pricier than other nuts might just be lower demand: outside of cookies, most people rarely eat them. So how to get them from the jar to your plate? Basil & Macadamia Pesto (Real Food Pledge) – use macadamias instead of pine nuts. 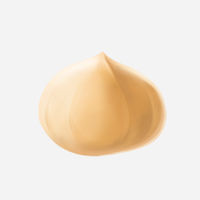 Macadamia nut butter (Free Range Human) – use macadamia butter instead of almond butter. Coconut-macadamia chicken tenders (Stuff I Make My Husband) – use grated macadamias instead of almond flour for breading. Macadamia, cashew, and apricot bars (Paleo with Cream) – use macadamias instead of almonds or other nuts. Paleo trail mix (Hollywood Homestead) or this trail mix (Elana’s Pantry) – for your grab-and-go snack needs when you want something a little fancier than just a plain handful of nuts. Just to reiterate: nuts should never be the core of your diet. Paleo meals don’t have to include nuts, and they should never take the place of meat or vegetables on your plate – nuts are always an extra. But they’re a pretty darn tasty and convenient extra, and choosing macadamias instead of other types of nuts can maximize the health benefits while minimizing the potential problems. Macadamias are lower in Omega-6 PUFA and higher in monounsaturated fat: they’re a little more expensive, but the price tag is worth the health benefits. Monounsaturated Fat: What Makes A Fat “Good”?